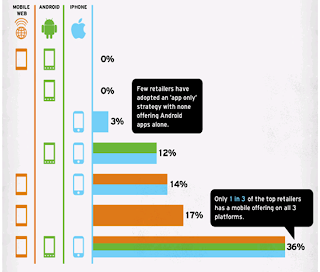 With at least 52% of Australian’s reported as owning a smartphone in 2012, M-Commerce is taking off. Google Insights reports that 28% of Australian smartphone users have purchased through their device (excluding tablets and other mobile devices). With the new generation of consumers spending at least 55% of their internet consumption through their phone daily, this is only likely to grow. US Retailers notorious Thanksgiving weekend in the is the prime example of consumers looking to multichannel shopping methods, with 25.3% on sales coming through mobile. Skava, who works with 6 of the top 30 internet retailers, saw a traffic increase of at least 100%. The graph above shows 2012 data outlining what devices retailers are using – mobile site, android app, iphone app; with 36% of retailers offering all 3. As an avid mobile user, there’s nothing worse than a desktop site trying to squeeze on the screen, with frustratingly small buttons and flash images that don’t work. Luckily, it seems that non-optimised sites are becoming a thing of the past – and now it’s about who is doing it better. Looking at last year’s ‘Top App’ lists, it’s not suprising to see the majority are based around games or services as opposed to products. As retailers continue to innovate and adopt more technology, I’m sure they’ll be heading up the lists in the near future. Create a shopping list by scanning barcodes? Yip, you can do it with the Woolworths app. If someone has downloaded your app, they like your brand. Smart retailers are making the most of the opportunity to target promotions and advertising through to their users. The H&M app shows you the latest promos simply by shaking your phone and will send push notifications about offers and events at the local store. Adding personalized features engages users and adds to the customer experience to keep them coming back. Most fashion retailers offer a ‘favourites’ or ‘shopping bag’ option. Kresta gives you the opportunity to take a photo of the window you need new curtains for, and try out different colours. So, where to from here? E and M Commerce is a focus for many retailers as they look to service the omni-channel future of shopping. Finding the right mix and making the experience harmonious is where some are coming out on top over others.